As your local fence contractor we proudly serve the greater Seattle area, Bellevue, Renton, Kent and all of puget sound areas. We have plenty of choices of fences to choose from on the list located to your left. 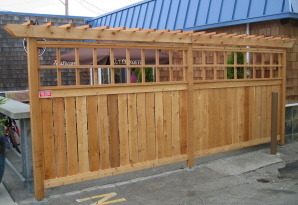 Cedar Fences, Chainlink, Metal, Iron and Custom Fences are our specialties. In brief, you should know the following about us: our company was established in 1988 and had been responsible for providing outstanding fence around the puget sound ever since.